Presidents race is no longer “The Main Event” | Let Teddy Win! There is your answer. You can’t have a GEICO race when State Farm is the MLB ins company. It all changes in the playoffs. I am surprised that they were allowed to hold it. 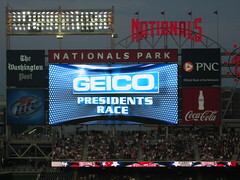 It actually seems a bit bush league to have a presidents race during the playoffs. I understand about not having GEICO there. That doesn’t explain the missing “Main Event” part. I hope that sticks. Just idle curiosity, but at last night’s game, the rankings chart showed 30 wins apiece for two of the presidents and 27 for the other (plus the four post-season wins for theodore)…. that adds up to 87 regular-season wins… but they only had 81 home games, right? were there six ties that counted as wins for two presidents, or something else? 1) Sometimes two wins are awarded for a single race. For example, George and Tom race on a tandem bicycle, each gets credited with a win. This explains why the number of ‘W’s doesn’t match the number of games. 2) Sometimes the Nationals inexplicably screw up the numbers that appear on the outfield scoreboard. For example, on May 19 this year, the Nats awarded two ‘W’s to Jefferson after one race. On September 9, they awarded a ‘W’ to Lincoln after Jefferson won and was declared the winner. That’s why we created the standings here on the site — because frankly the Nats numbers aren’t reliable. I would love to have our numbers match, but I have contacted the Nationals and they refuse to explain their bizarre numbers. 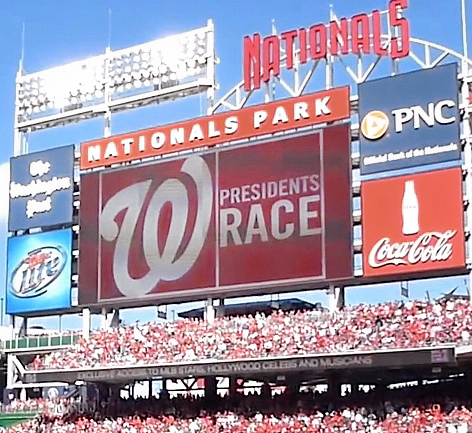 As you probably know, the presidents race has gotten a lot of press recently. Both NPR and The Washington Post had editors fact check the standings, so that they could know which numbers were accurate when they referred to the total number of wins and losses. In both cases, they chose to quote the numbers from this blog instead of the ones the Nats display.